Fish is an integral part of Kerala Cuisine. 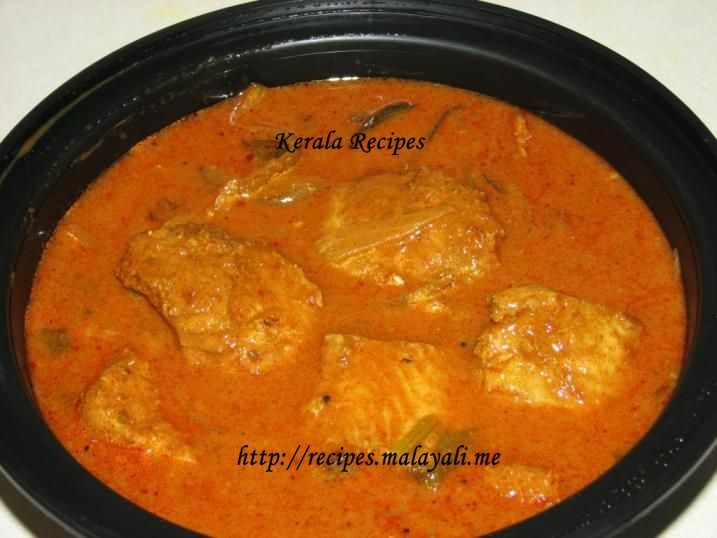 There are hundreds of variations for Kerala Fish curry. Some use Kudam Puli (Gambooge/Malabar Tamarind/Fish Tamarind), while others use tamarind or tomatoes. Some prefer it with Coconut Milk. Others roast and grind Coconut and so on. Here is the recipe for Fish Curry With Kudam Puli which uses roasted shallots and spice powders. I have used Tilapia in this recipe. The roasted shallots and powders impart a nice taste to the Tilapia. You can use this recipe with any Fish. Keep this curry for at least 5 hours before serving so that the gravy absorbs all flavors. Clean, wash and cut the fish into medium sized pieces. Add a pinch of turmeric while washing the fish. Marinate the fish with 2 tbsp Fish Masala Powder, 1/2 tsp ginger paste, 1/2 tsp garlic paste and salt. Keep it aside for half an hour. Soak the Kudam Puli in a little water. Heat oil in a kadai and splutter mustard seeds. Add onions, green chillies, curry leaves, ginger and garlic and saute for a while. When the onions turn brown, add the ground masala paste along with 1 cup water and salt. When the gravy starts boiling, add the fish pieces and kudam puli/gambooge pieces. Add more water if required, so as to cover the fish pieces. Cover and cook on gentle heat for around 15 minutes. If you like the taste of cilantro, garnish with a handful. Thank you Jisha so much for a wonderful recipe. I tried this fish curry with trout and it was absolutely tasty . I also used 4 small pieces of kudampuli. God bless you. I roast it for around 5 minutes on low heat.